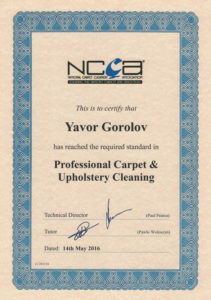 NCCA is one of the most respected and authoritative associations for training carpet cleaners. It was founded in 1968 and is devoted entirely to the cleaning, maintenance and restoration of carpets. The main objective of the association is to provide certificates of professionalism and high standards to partner companies that have passed a special test for practical knowledge and skills. This ensures the quality of the services of certified companies. Fine Carpet Cleaning has already passed successfully the exams and trainings for professional carpet cleaning and upholstery cleaning. 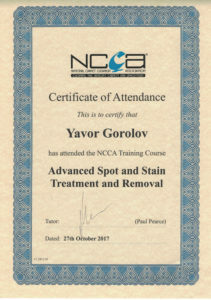 We have passed the special advanced spot and stain treatment course and exams for handling with all types of stains and spots on your carpet or upholstery. Finding a quality specialist needed for a service related to your home can be a real adventure. We all know how many of these professionals are actually inexperienced or cheated with high prices and low quality services. Here comes Checkatradе, an organization found in 1998 to help consumers in UK finding their specialist in a particular area, such as quality carpet cleaning. The main goals of the organization are the collection of all quality companies in one place covering high standards, transparency in customer service and prices. The accreditation of Checkatrade includes over 20 inspections, including: ID, reviews, insurances, qualifications, membership in professional organizations, and more. After creating a listing on the Checkatrade website, each company is then permanently monitored based on user feedback from the pages of the organization’s website. 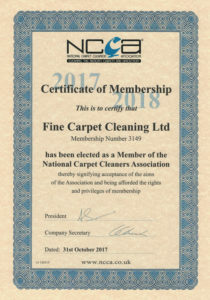 We at Fine Carpet Cleaning are proud of the fact that we have passed all the checks of the organization successfully and are certified.